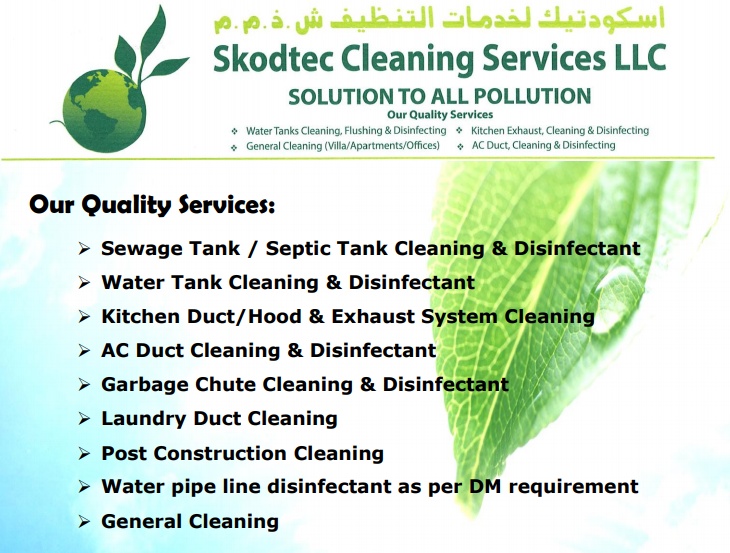 Skodtec Cleaning Service is a professional cleaning company based in Dubai, United Arab Emirates, offering a complete ranges of cleaning solutions to meet our customer’s requirements, from General Cleaning Services to the more Hygiene and specialized in HVAC Duct Cleaning, Air Duct Cleaning & Disinfection, Kitchen Hood and Exhaust Cleaning, Water Tank Cleaning and Disinfection, Laundry Duct Cleaning and Garbage Chute Cleaning and Disinfection. Our team of highly skilled professionals, talent, and creativity with understands the clients’ requirements and possesses the technical skills to cope with changing needs of the industry. Our staffs are fully bonded and insured and are covered under workman compensation insurance. Whether it’s your home, business, rental property or listed property, we can help.